Participants will leave the hotel in Trondheim after an early breakfast and travel by bus and ferry out to the island of Smøla. The bus departs from the hotel in Trondheim at 07.30 a.m. When we arrive at Smøla we will head to the wind-power plant. Here we will learn about the on-going research by NINA, and have a look at the research facilities, such as the mobile bird-radar and the automated camera-systems. Statkraft, the owner of the wind-farm will brief us on the technical issues related to the power-plant. Lunch will be served while at Smøla. Early May is the peak time for flight-activity of white-tailed eagles in the area, and hopefully we will see eagles soaring among the turbines. The participants returning to Trondheim will take the bus departing from Smøla Friday afternoon, arriving in Trondheim around 21:00 p.m.
Those participants joining the Runde seabird fieldtrip will continue from Smøla by bus, while those joining the fieldtrips at Smøla (White-tailed eagle photo safari or sea fishing trip) will check in at a guesthouse at Smøla. The following tours are possible extensions to the Smøla wind-power plant excursion. 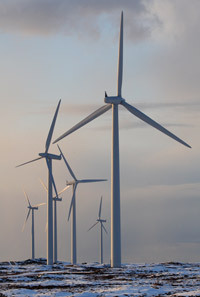 The following tours' prices include both the actual excursion and the Smøla wind-power plant tour. The municipality of Smøla consists of one large island surrounded by thousands of skerries and small islands. This area is one of the best areas worldwide to observe the magnificent white-tailed eagle. On this trip, expert guides will take you by boat to the archipelago surrounding Smøla. When an eagle is spotted, the guides will throw out fish, and then excellent photo opportunities will happen when the eagles stoop down to grab it from the water. Breathtaking! The guides will take the participants out Friday evening and optionally again Saturday morning to provide the best possible light for photography. On Friday night a dinner will be served at a local restaurant. Early May is also peak-time for migration in this part of Norway, so a large variety of birds, including arctic migrants, can be expected. After a lunch at the guesthouse on Saturday, the participants will return to Trondheim with the expressboat leaving from Smøla 15:10 arriving in Trondheim 18:10. The oceanic waters around Smøla are rich in fish, and attract sports fishermen from all over Europe. Participants on this trip will be taken out on the sea to do some real fishing. An experienced guide will be leading the trip, taking you to the very best fishing-spots. The boat will depart from the guesthouse, which is located by the sea, right after breakfast Saturday morning and return in good time to catch the expressboat back to Trondheim leaving from Smøla at 15:10 on Saturday afternoon. Arrival back in Trondheim at 18:10 on Saturday. Runde seabird cliff and Norwegian mountains. Friday 6th – Sunday 8th of May. Runde has the largest seabird cliffs in southern Norway. 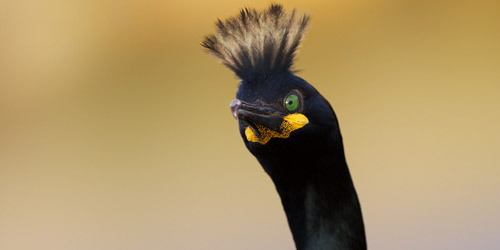 Thousands of puffins, shags, guillemots, kittiwakes, gannets, great skuas and other seabirds, all situated in a dramatic landscape will ensure a fantastic bird-watching experience. Along with these seabirds white-tailed eagles and peregrines will be patrolling the cliffs. This fieldtrip will also be a great opportunity to see the world-famous Norwegian fjords and mountains. En-route from Smøla to Runde we will take the Atlantic Road, this 9 kilometre stretch of road that zigzags across low bridges on the outermost skerries. The road is chosen as ”Norway´s construction of the century” and is also chosen as the world´s best road trip of the British newspaper The Guardian. Arriving at Runde late Friday night, after stopping for dinner en-route, we will check in at a local environmental centre with great accommodation facilities. After breakfast Saturday morning we will head up to the bird cliffs to watch the seabird spectacle guided by a local expert. We will spend the whole day at the bird cliffs before we head down to environmental centre to check out from our rooms and return with the bus to Trondheim. En-route from Runde to Trondheim we will stop for dinner, the bus will drive through some spectacular scenery with deep fjords surrounded by steep mountains, including the “Trollveggen”, a 1000 meter high vertical cliff which is regarded as one of the most challenging climbs in the world. In the late evening the bus will pass over the Dovrefjell mountains. We will arrive in Trondheim early Sunday morning. Even though part the return journey is by night, there is enough light at these latitudes to get a good view of the scenery. All excursions require a minimum number of participants. If you want to travel on your own in Norway in connection with the conference, we recommend the official travel guide to Norway http://www.visitnorway.com/.